Euler is a famous for having discovered oodles of really beautiful maths. His surname is pronounced “Oiler”. A few years back I went to the cinema with some friends to watch “The Imitation Game” (a film about yet another famous mathematician). When Keira Knightley’s character pronounced it “Yoo-ler” instead of “Oiler”, we all cringed and got very cross. Well, really! “If you take any polyhedron, add together the number of faces and vertices and subtract the number of edges, you will always get the number 2. As long as there are no holes in it, this works for any polyhedron at all: big ones, small ones, pink ones and even ones made out of sausages, the answer is always 2”. 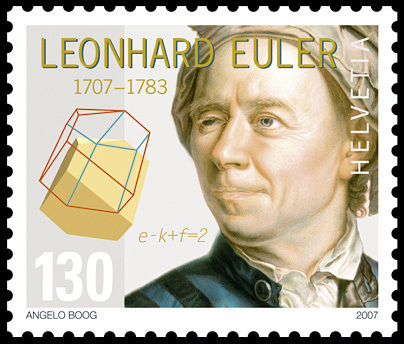 Here’s a postage stamp featuring Euler, a strange looking polyhedron, and his famous equation. It’s from Switzerland, which is why the equation uses different letters. As an example of Euler’s equation, have a think about a cube (or better still, go and find one or make one). How many sides does your cube have? Oops, 3D shapes don’t really have “sides”, but you should find that it has 6 “faces”, 8 “vertices” (a bit like the “corners” on a flat polygon) and 12 “edges”. Now then: 6 + 8 – 12 = 2, so tadaaa, Euler was right! Amazingly, the answer to f + v – e is always 2, even for a hexagonal prism, an octagonal antiprism, a rhombicosidodecahedron or any other polyhedron you can possibly come up with. 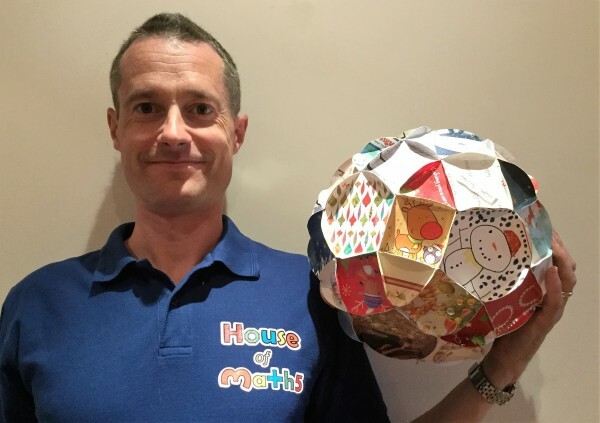 Here’s a photo of me with a rhombicosidodecahedron, and here’s how you can make your own out of Christmas cards. What kind of maths workshop or maths show would Euler do at your school if he were alive today? Probably a really fun one with lots of brilliant 3D shapes. Because he found such an amazing pattern about polyhedra, and inspired me to be a better mathematician, Leonhard Euler is one of my SUPERSTARS OF MATHS!! !